Blue Chamomile Essential Oil is an exceptional oil, highly valued for its aromatherapeutic benefits and beautiful deep blue color. Main Chemical Components: Bisabolol oxide, farnesene, chamazulene (produced during steam distillation, not present in the fresh plant). German Chamomile essential oil, also known as Blue Chamomile or Chamomile matricaria, is a calming, cooling and nourishing oil. The beautiful, deep blue color comes from chamazulene, the constituent which is formed during the distillation of the oil. The odor is strongly sweet and adds a warm, long-lasting undertone in perfumes. Blue Chamomile essential oil is commonly used in massage oils, skincare blends and herbal mixtures. 2 drops Ginger essential oil. 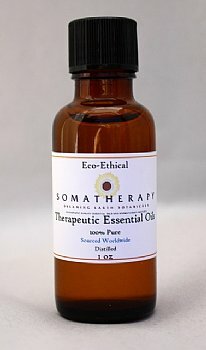 Blend essential oils in 1 oz of carrier oil and apply for a gentle massage.